We all know how wearing wired headphones can some times be a pain. I know for me being a mom with little ones and being that my job other than blogging, a transcriber, requires me to wear headphones so that I can hear the audio I was given to type out. It was always a pain and inconvenient when I had to pick up and hold my kids when they were younger and, yes, multi-task and type with them on my lap. I'm happy to say that I won't have that problem anymore with my newest little one, thanks to Jabra's Rox Wireless ear buds. If you haven't gotten yourself a pair of Jabra's Rox Wireless ear buds, go get them now, you won't regret it! These earbuds are perfect! Rox Wireless’s design is based on the same in-ear monitors used by professional musicians to bring full sound and strong bass. This is perfect for those of us who listen to music on our iphones/smartphones or ipods while at the gym, out walking in your neighborhood or doing yard work. They also work and are compatible with tablets and your laptop/computer. How great is that?! I love that they connect really fast with whatever device you choose to use them with and they're super comfortable to wear. They also hold their charge really well with long playback and standby time (5.5 hours/ 8 days). They work really well if you have your device in one part of your house and are using the ear buds in another part of your house. It was great being able to listen to music on my phone as I was cleaning my kitchen and being able to take the trash out to the street without losing connection. These have become a favorite for both my husband and I. He is currently using them with him as he is out of town on a business trip and he loves that when he isn't using them he can simply click the earbuds together around his neck and the magnets will activate the power- saving mode so that when he decides to use them again, the battery hasn't died. These earbuds are small and light so that you can take them just about anywhere with you. Another thing I love about them is that I can use them on my phone and connect them to my van that has bluetooth connection and answer a phone call if I need to. These are perfect for music lovers everywhere and would make a great gift this upcoming Holiday Season. 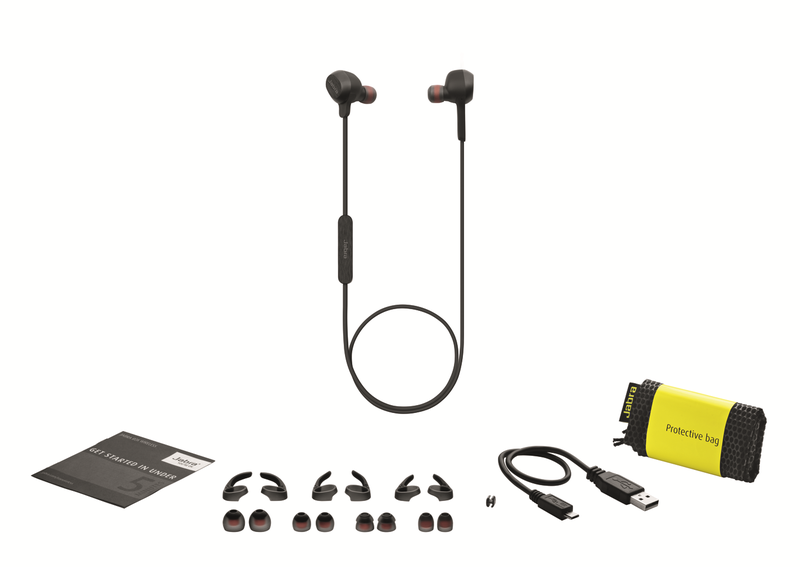 Jabra Rox Wireless earbuds retail for $129.99 and are available at Best Buy, Future Shop, Apple stores and www.apple.ca. For more information about Jabra and their products be sure to follow them on Facebook, Twitter and Instgram. Disclosure: All opinions are my own. I received a pair Jabra Rox Wireless at no cost for the purpose of this review. No other compensation was received.